Exeter City manager Paul Tisdale says he is pleased to have Matt Oakley's experience back in his squad. The 38-year-old former England Under-21 international, has featured as a substitute in the last two games after recovering from a knee injury. "Some players will have lots of games under their belt, but perhaps won't pick up the finer points and make good decisions," Tisdale told BBC Sport. "He understands the game particularly well and he reads the game." Oakley played the second half of City's 2-1 win at fierce rivals and League Two leaders Plymouth Argyle last Saturday and came on for the final 25 minutes in the 2-0 win at Mansfield on Tuesday. 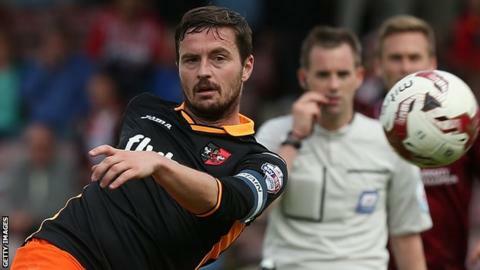 He is in his fourth full season at Exeter after a career which has seen him make more than 600 appearances in all four tiers of English football with Southampton, Derby County and Leicester City, as well as playing in the 2003 FA Cup final. "As a manager it's really good to have thoughts on the bench and discuss the way the game is going," added Tisdale. "When you have to adapt constantly during a game it's great to have someone who can carry those instructions out. "On Tuesday I discussed four or five decisions with him and Danny Butterfield. He's the ideal person to discuss it with because he's the one who's going to have to go on and carry it out."